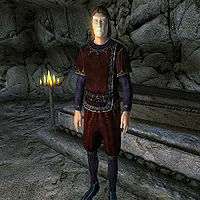 Hindaril is a "powerful" Altmer vampire needed for the Vampire Cure quest. In the quest, your objective is to kill him to obtain his ashes. According to Melisande, Hindaril is such a powerful vampire that he was sealed into Redwater Slough to stop him from terrorizing Cyrodiil. Due to this, Melisande is clearly surprised when you return to her having bested him. Hindaril wears a red velvet blouse with a pair of matching garments and blue suede shoes. He has all the benefits of 100% vampirism as well as its drawbacks. When asking for his ashes, Melisande will describe the overly dangerous vampire: "This one is... difficult. It may be quite a trial for you. But if you are successful, it will make the cure all the more worth it. You have come across a vampire or two in your travels, perhaps? I assure you, they are nothing like what you must face. The vampire you seek is powerful, so powerful that those who sought to destroy him were unsuccessful, no matter what they tried. The best they could do to was to imprison him underground, where he survives to this day. Search near the North Panther River for Hindaril. If you can vanquish him, his ashes will be more than adequate for my needs." She will be quite surprised once you manage to kill him, saying, "Hindaril is destroyed? You are indeed a force to be reckoned with. I shall take the ashes; finally, some part of him can be put to a good use." If you already have the ashes in your inventory, Melisande will cut short her speech and simply comment, "Well, well. It would seem you've been busy out on your own. I need the ashes of a powerful vampire. You have them in your possession. It is good to see that Hindaril has been defeated already." This page was last modified on 9 April 2017, at 21:23.